Customer engagement has evolved to encompass much more than enticing shoppers into your store with flashy signs and gimmicks to encourage them to spend more. In an increasingly omnichannel and mobile retail world, the potential for customer engagement has expanded to channels outside the four walls of your brick-and-mortar store. Digital channels like social media, your website and email marketing are ways you can connect with your customers even when they’re not right in front of you. In fact, 15 years ago consumers averaged just two touchpoints when buying an item. Today, the average is six. Although technology has helped increase the reach of your brand, it’s still up to you to deliver valuable content and a positive customer experience at every one of those touchpoints. Customer experience (CX) goes hand-in-hand with customer engagement because its definition is the customer’s perception of your brand at each touchpoint. If you don’t believe us, maybe the 52 percent of respondents that said a bad mobile experience would make them less likely to engage with a company will convince you. Never underestimate the impact of customer experiences on your bottom line. A PricewaterhouseCoopers (PwC) study found 60 percent of consumers would shop elsewhere if they received unfriendly customer service experiences, and 32 percent would stop doing business with a brand after only one bad experience. Let’s take a look at five ways you can keep customers engaged with your brand and offer a positive experience at the same time. Customer engagement is a personal process. Most consumers have grown accustomed to personalized shopping experiences, especially online. Websites and apps greet them by name, store their credit card information, and make suggestions based on their browsing and purchase histories. You can do this too by leveraging data from your Point of Sale (POS) system, customer loyalty program, or Customer Relationship Management (CRM) to target email offers to customers in a particular demographic or with similar shopping histories. All this shows customers that your brand recognizes and appreciates them — delivering the ultimate customer experience. Although technology makes shopping comfortable and more convenient for many people, your customers still want human interaction, which will increase your customer engagement. As you put more technology solutions in place and build a connected retail environment, make sure you continue to focus on training your team to provide excellent customer service. In fact, more reliance on technology should free up your staff to spend more quality time with customers. Your staff should regularly provide consumer experiences consistent with your brand and remember, always make a good first impression. Sales associates and other personnel who interact with customers need to be personable and approachable to demonstrate they have customers’ best interests at heart. CRM and sales data can reveal patterns in customer preferences and behaviors, but there is another, an even more straightforward strategy that can provide you with more profound insights into what your customers want: Ask them. While you may get a passive ‘yes’ from patrons who don’t want to be bothered, you’re looking for the ones that say ‘no’ — and that’s when you strike. You hit them with the ‘why not?’ Why didn’t they find what they needed? Let them tell you. Maybe you don’t stock the item they wanted to purchase. Perhaps you were out of the product the customer needed. Or possibly they thought the item would be in one section of the store, but they found it in another. The answers can give you insight into the kind of products you carry, if your inventory supply isn’t keeping up with demand, or that maybe you need to make adjustments to merchandising and store layout. But, you’ll never know unless you ask. You may find that your more passive in-person customers are a little more lively over email. That’s where email survey platforms like SurveyMonkey come into play. A customer satisfaction survey can pose questions about different types of shopping experiences or focus on one area, such as merchandise or pricing. Customer surveys give you a straight-from-the-source view of your brand’s performance and perception from the people that matter most — your customers. And since some customers aren’t comfortable with face-to-face interaction, especially if they don’t have something nice to say, an email survey is the perfect alternative. Lastly, if customer feedback is visible to other consumers on the internet or social media platforms, remember to monitor and respond to comments. Your prompt, courteous replies—especially to negative comments—will demonstrate your brand is committed to excellent customer service. A study by MediaKix found the average person will spend more than five years of their life on social media. Furthermore, a PwC consumer insights survey found that social media is the most common place shoppers find inspiration for purchases. Your customers’ presence on social media makes it a great place to meet, engage, and provide them with the inspiration for which they’re looking. You can use social media as a customer support tool or as a vehicle to collect feedback, but there are also creative ways to use social media too. Consider creating a hashtag they can follow so they can share photos of their finds from your store. Try gamifying a promotion with social media as a component. For instance, offering discounts and promotions on athletic wear to customers who track their fitness and reach their goals. You can also launch a digital scavenger hunt by daily vlogging clues on YouTube. A bonus of your customer engagement activity on social media is the data you can collect. It provides an additional dimension to data analysis based on in-store and e-commerce activity. Thanks to the internet, consumers are smarter and savvier than ever before. That means traditional advertising is becoming less effective — especially among younger shoppers. A study by the McCarthy Group found 84 percent of millennials do not like traditional marketing — and don’t trust it. To appeal to a more substantial number of your customers, capture their attention and encourage them to engage with your brand by providing valuable content. Choose topics that are of interest to your target audience and offer it to customers through digital channels like email marketing, a blog on your website, and on social media. Not only is content marketing effective, but it’s quickly becoming a necessity to stay competitive. According to Marketing Charts, more than half of global digital marketers are increasing budgets for content marketing and content marketing was the top digital marketing priority for marketers last year. As you execute your customer engagement strategies, make sure you measure your efforts. You’ll want to gauge progress toward overall business goals and identify areas of improvement. Using reports and analytics from your point of sale software will show business growth as a result of new customer engagement efforts. You can also use social media analytics and e-commerce sales data to determine if your efforts paid off. Shoppers now use multiple channels to make their purchases—providing you with numerous opportunities to connect with them. Expand your strategy to meet shoppers where they are, on their channel of preference, to educate, inform, and entertain them with your brand and valuable content. 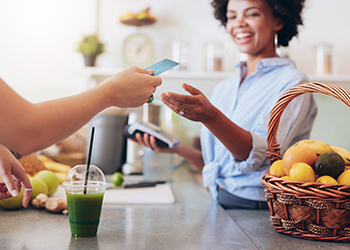 In the increasingly competitive retail landscape, your level of customer engagement can set you apart from the competition and help you achieve success.